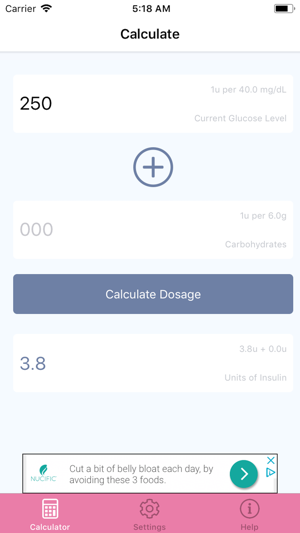 Quickly calculate your insulin dosage based on how many carbohydrates you are consuming as well as your current glucose level. 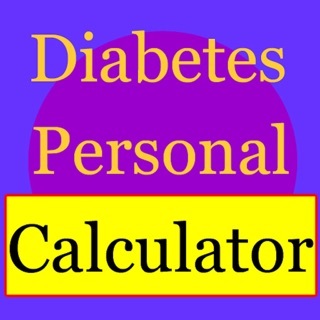 You enter your desired glucose level, your correction factor, and how many units per grams of carbohydrates so we can give you an exact amount of insulin down to the decimal to take quickly so you can get back to enjoying your better meal. Apple Health Integration. 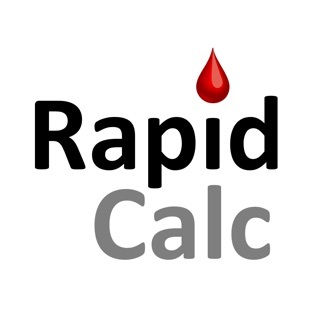 Do you use another app that tracks your blood glucose and/or carbohydrates? 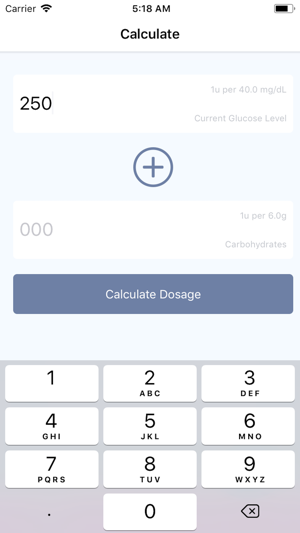 When you enter your current glucose level for a correction factor, or enter how many carbohydrates you are consuming InsulinCalc will save this data to Apple Health to be used across all these apps that have access so you don't have to type them in multiple times in different apps. Thank you for your continued feedback. This update fixes and issue where it stores your Desired Glucose Level rather then your current Glucose Level. 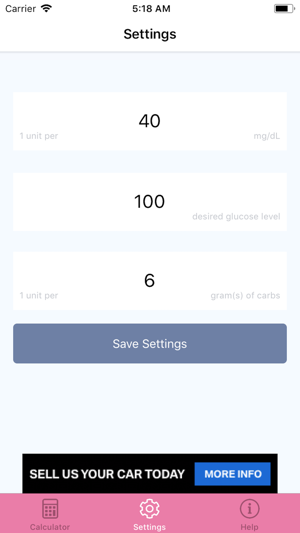 We have used this app and while I like the simple, straightforward layout, there’s a few suggestions I’d like to pass along: being able to add the carbs in the carb area would be much easier but I can live without that feature - would be nice though. Tonight I discovered the top calculation area doesn’t take into account if your blood sugar is below 100. For example, if you are “low” the top calculation should be negative. Then when you “add” it to the insulin dose needed for the carbs eaten, it will subtract some in order to help you come back into range. 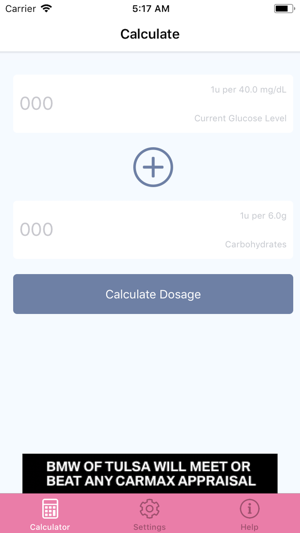 This app doesn’t do that and if you use the dose it gives you, you will become even lower because you are dosing with more insulin than needed. This is a real problem and I therefore can no longer use this for calculating my daughter’s insulin. I cannot risk her becoming dangerously low due to a simple error in calculation. I hope the developer can look into this. Thank you for your feedback. This is something I currently have built into my test version and something I am working hard to get published, however I am currently awaiting FDA approval as required by new App Store policies. I don’t have days and hours to spend playing on an App! But I desperately needed something with my target number, my present BG reading, my projected carbohydrates, to figure out how much insulin I need to take before I eat. Hallelujah here it is! The only downfall is; I can’t see/read the screens because of the coloring and font sizes. I’d settle for black-and-white with a bigger font; and I’d be a happy camper! And I would let all my contacts at the local hospital and regional Diabetes people know about this app. Because I have all of them looking for an app for me. I just happened upon this today! I really like this app. It makes calculating fast-acting insulin to cover meals a snap! Under settings, you put in your target BG and, when you’re calculating for the # of carbs to be eaten, it even adds the correct additional dosage to bring your BG back on target. The default setting for how much 1 unit of insulin lowers BG is set for 40 mg/dL, which for my petite height and weight wasn’t correct. So I adjusted that setting and the app works perfectly! I like that you can personalize the settings for your individual needs. Great app! I highly recommend!